Presented by Capital Bank, the NCT Capital Awards is a program designed to recognize outstanding high school musical productions and performances. According to a fan that was able to attend the awards this evening, Clay looked GORGEOUS!! He wore a dark gray suit, a white shirt and the same tie he wore to the GLAAD Awards. The fan reported that his hair was similar to the style at The David Foster Concert. She also commented that the color seemed just right. Another report had him wearing a black tux. I think we need a picture!! Clay was the last presenter of the evening, giving out the award for the Best Musical. The hostess of the evening gave Clay a wonderful introduction saying that Clay was a real star. She mentioned that Clay had sold millions of albums, been on TV numerous times, is the author of a best-selling book, and had a starring role on Broadway as Sir Robin in Spamalot. She also mentioned his work with UNICEF and the fact that he was the father to a beautiful baby boy. Clay talked about the performing arts and how important they are in schools and communities. According to the attendee, the show was filmed for a TV showing on June 30th. Clay did a promo that the NCT will use to promote the show. Clay attended the program with his mother, Faye. How sweet to take his mother…. Can I tell you how much I love Clay Aiken? Thanks, much for the recap. I’m glad Clay Aiken is able to provide his presence and give encouragement to these aspiring actors and musicians. I hope we get pictures too. I think Clay will stay involved in the community-his heart is there I think and he wants to raise Parker there. I can’t wait for the video. I love him to pieces too! Glad to see you had the sighting here first. Hoping to see pictures from the Raleigh event with Clay Aiken presenting. What an honor for Clay Aiken in his home town! Thanks for the recap of the NCT Capital Awards. Clay Aiken has always said that it is very important for all of us to support our local arts programs. He sets a good example for all of us. Can’t wait to see some pictures from tonight’s event. I’m happy that Clay Aiken is able to stay involved in the theatre program in Raleigh. I’m certain the presentation was very nice!! That Clay AIken guy is pretty great! I’m so glad he has stayed involved in the arts in his own community of Raleigh. I hope Raleigh is as proud of Clay Aiken as his fans are. Sounds like it was a pretty classy event there tonight. 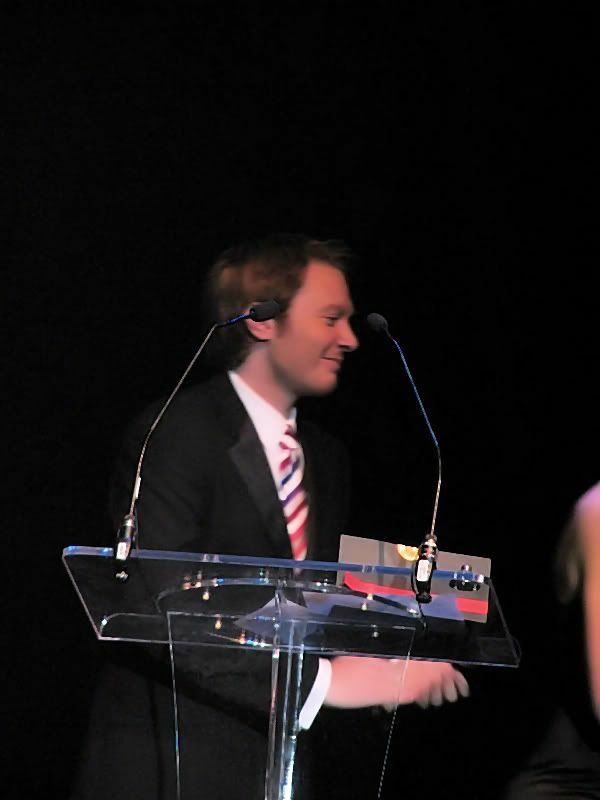 Thank you for the report about Clay Aiken presenting musical honors at the NC Theatre Awards event in Raleigh. Clay is in his element doing things like this….He loves anything to do with the community…..Raleigh is very lucky to have Clay there to support the arts. I think that is why the last tours, he has used orchestras from each area that he gone to…He really believes in supporting communities….. and the arts.. There is so much depth to Clay….he really is an amazing young man… I just adore him. Happy to hear about this event with Clay presenting an award to the best musical. It’s wonderful that he still supports the community where he once was a participant. Some stars never go back to their origins after they make it big. So nice to read about Clay’s dedication to his local community and his support of its arts programs. Raleigh area has a lot of very talented musicians and it is wonderful to see them supported and nurtured in the school system and elsewhere. Good for him!!! Clay Aiken has always spoken of supporting the local arts in every city he was in. Clay is a man of his word and leads by example and is showing his support of his home town. Bravo Clay, we are so proud of you in all your efforts to bring awareness to those in need. Great recap! It’s nice to hear of Clay giving back to his community and the warm reception that he received! Sounds like a great night! Clay Aiken is a wonderful man, always caring, always sharing. I forget to mention that I love that pic of Clay that you used. He’s gorgeous! I also love that pic of Clay. There was something about him with that blond hair. He was so gorgeous. He still is…and I hope we get a picture of him at the Awards Show. He is such a wonderful young man and never forgets his hometown and the people in the local schools and the Arts. Error: Error validating access token: Session has expired on Tuesday, 21-Aug-18 16:13:01 PDT. The current time is Monday, 22-Apr-19 07:35:05 PDT.